The Indian startup ecosystem is being propelled by a 123 per cent rise in the country's active investor count, IT industry body NASSCOM and Zinnov Consulting said in a new report. Rajan Anandan (Google Asia Pacific chief) and Ratan Naval Tata (former chairman of Tata Sons) are two of India's most active angel investor. As on September 3, Tata had made 16 personal investments in startups while Anandan had put money in 29 startups. 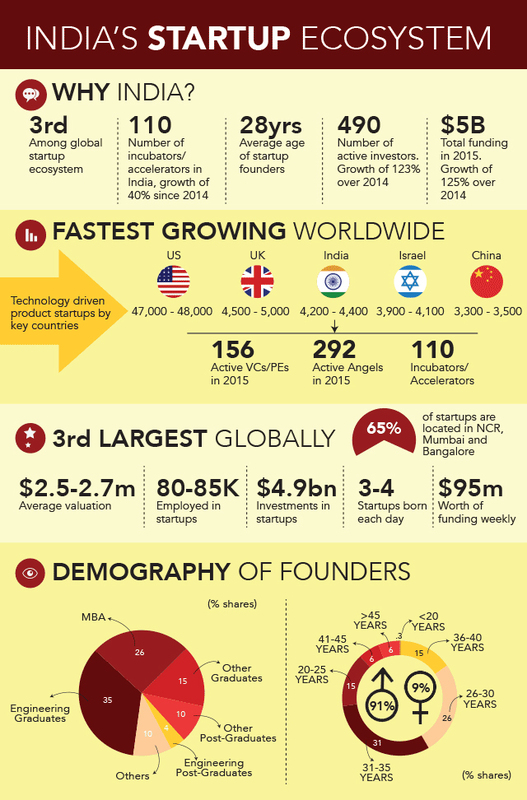 India is also the world's third-largest startup hub where three-four new firms are born every day. India currently trails the US (47,000-48,000 startups) and the UK (4,500-5,000 startups) in terms of overall startup count, the report added. Private equity and venture capital deals related to India have hit a record high with the number of transactions in the first nine months of this year already surpassing the previous best in any calendar year. Led by hectic activity in early-stage deal-making that comprised over four-fifths of the number of private investment transactions, investors signed a cheque almost every seven hours, according to data compiled by VCCEdge, the financial research platform of News Corp-controlled VCCircle Network. In total, private investors comprising angel investors, venture capital and private equity funds have announced investments worth $14.2 billion spread across 928 deals in the first nine months of this year, reveals VCCEdge Deal Report for Q3 CY2015.